Although we’ve never heard of this Texas based brand, there’s still no denying most people drink light beer. It was formulated by the inventor of Light beer, Dr. Joesph Owades. Here’s their official press release on the new owners. Newport Beach, CA… California Capital Partners, LLC, (Cal Cap), and an investment syndicate assumed the assets of Stampede Brewing Co. Inc., a Dallas, TX headquartered company on August 3, 2009. The Company transferred the exclusive rights for Stampede Light Plus™ to VitaL Brands, LLC, a marketer and purveyor of healthier alternative lifestyle brands. 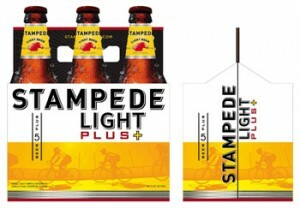 Stampede Light Plus is a super-premium light craft beer, formulated by the late Dr. Joesph Owades, the creator of the first-ever light beer in 1967, now Miller Light. Stampede is a full-bodied German style beer, made with premium malt, balanced with the finest domestic hops.